Messaging, networking and collaboration (MNC) is having a profound impact on social and business life in both China and the US. In this piece, we’re going to discuss the fundamental drivers of MNC in the work context, comparing Slack, a GGV portfolio company, with WeChat’s work-based attributes. In a second post, we plan to explore the MNC social use case, looking at WeChat and Facebook. Evidence of the Need — Awe Inspiring Growth & Engagement. WeChat launched in ’11 as one of the first real-time, mobile-first MNC services in China. Since then, WeChat has grown incredibly to over 700M MAUs as of June ’16. Users are extraordinarily engaged with the app. More than half of WeChat users spend over 30 minutes per day on the app and 32% spend at least 2 hours per day. WeChat’s payment capabilities, which add to its importance in users’ lives, have been well chronicled by folks such as Jon Russell and Connie Chan. Obviously not all WeChat users are performing work-related activity, but enterprise account use is growing fast. 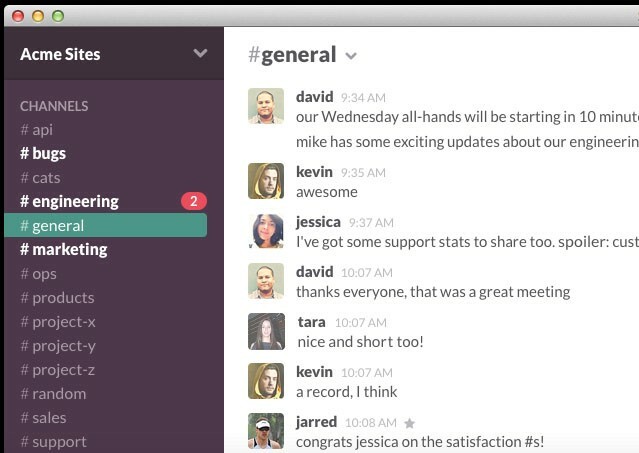 Slack launched more recently, in February 2014. As of May ’16, Slack announced it had surpassed 3M DAU and the growth curve has been very steep. Slack users are extremely engaged, spending an average of 10 hours per day with the service open and over 2 hours per day actively messaging. Topically Contextual — Ideal Interface During the Work Day. In the US, email has been the dominant digital messaging and collaboration framework for the past twenty years. Given email’s open protocols and ubiquity, work inboxes have become chaotic, a cacophony of one-to-one work emails, group messages, document distribution, personal missives, Google updates, newsletters, marketing spam and, increasingly, hacking attempts by fraudsters. Level of urgency and senders’ expectations of response times vary widely, making prioritization a challenge for any knowledge worker. Slack’s rise has come, at least in part, from its clean, simple interface and channel-based hierarchy. Users within a Slack group are all related, typically working within the same team or company, and message either within channels or privately in a DM-like fashion. Users can spot unseen messages easily and are able to respond fluidly, more conversationally and in a less structured format than email. In China, email was leapfrogged by MNC apps, with WeChat leading the way. WeChat has been rapidly adopted by companies, who create both public and private groups, often around topics or teams, similar to Slack channels. Seemingly everyone in China is already on WeChat, so users need to negotiate social and work usage within one interface. WeChat’s popularity makes it easy to create work-related groups extending beyond one organization; for example, most Chinese GGV portfolio companies establish a board of directors group, for rapid fire communication. Contact & Group Management. When two people meet in China, they’ll invariably exchange WeChat credentials. The app makes this quite simple through the use of barcode scanning, which WeChat adopted long before Snapchat and others added this feature. As such, in the same way that LinkedIn is driving the business card to extinction in the US, WeChat is rapidly becoming the primary contact database for most people in China. 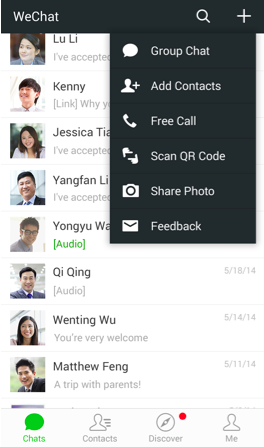 Even more powerful than LinkedIn however, WeChat harnesses contacts with its messaging and collaboration features. When companies use WeChat to create enterprise groups, everyone is already on WeChat and easily locatable, making building topic based communication a snap. Similarly, grouping people from different companies around a topic of interest is no longer difficult given WeChat’s ubiquity and ease of finding people. Due to Slack’s focus on internal messaging and collaboration, Slack groups often initiate offline and relevant people are typically invited through email to join a group. In larger companies, many separate Slack groups are frequently created, sometimes unaware of each other. As Slack has matured, it has made it easier to consolidate groups, and with the pending launch of more enterprise features, Slack will make it simpler to live in multiple groups and for users to discover groups and channels in which they have an interest. Similarly, Slack users from different companies will increasingly find features allowing for more seamless group creation and management. Productivity Workflows. Slack makes it very easy to set up channels within a group and to create simple rules of engagement within channels. Although groups need to be careful to avoid channel sprawl, channels make it very easy to context-switch in a rapid-fire manner. Slack’s many integrations and growing application directory, also allow for lots of machine initiated auto-firing of information in both prompted and unprompted modes. Slack’s recent release of Buttons provides an intriguing deeper integration layer, enabling one to execute actions in other apps within Slack, vastly reducing the need to leave a well-designed Slack group environment. WeChat’s Enterprise Accounts were launched in ’15 to enable the use of WeChat for inter-company messaging all within a single tab, helping separate work related use of WeChat from social uses. The more recent announcement of Enterprise WeChat debuted a separate app for work communication to create even more of a gap between one’s work and social lives. To date, 70% of enterprise WeChat users cite increasing efficiency of internal management as the primary driver of their use of the app, with other factors being the simplification of business processes and increasing corporate and service efficiencies. To date WeChat’s integration API is, arguably, not as built out as Slack’s but there are myriad official accounts, which are lighter weight integrations, available and over time we expect more traditional applications to run on and within WeChat. Enterprise Knowledge Management. Slack has made search a hallmark of its utility. In companies and groups that have standardized internal communication on Slack, especially those that have also integrated auto notification channels from key enterprise systems (eg, Salesforce notifications, Zendesk ticket updates, etc), Slack search serves as a primary knowledge management hub. The archive rapidly becomes a trove of data. As Slack itself and third party developers incorporate more artificial intelligence, Slack’s power as a knowledge repository will grow, anticipating and surfacing important information to the appropriate user instead of waiting for a search prompt. WeChat lacks powerful networked search today, nor has it taken steps yet to incorporate automation into its platform, but one should assume these features are coming, especially now that WeChat has launched an enterprise focused app. Slack and WeChat are both growing extremely engaged, work-focused user bases incredibly fast. While Microsoft Office is under attack from many angles (see Ben Thompson’s Stratechery post here for a great summary), it remains the single most important knowledge worker franchise in technology. MNC services such as Slack and WeChat are rapidly displacing Office and other document based solutions as the key tool in the knowledge worker’s tech stack. Document creation and sharing will never go away, but services like Slack and WeChat are driving the growth of new artifacts (eg, notifications, auto-responses, check-ins, bot messages, etc.) that are becoming table stakes for the knowledge worker. This is why at GGV we’re so excited for Slack’s future and why we’ll continue to seek ways to work with both Slack and WeChat going forward. Glenn Solomon is a Managing Partner with GGV Capital. Some of his recent investments include BitSight, Zendesk, Square, Pandora, Successfactors, Nimble Storage, AirBnB, Slack, Opendoor, Domo, HashiCorp and AlienVault. Follow Glenn on Twitter (@glennsolomon) and on his personal blog. Hans Tung is a Managing Partner with GGV Capital. Some of his recent investments include Wish, Musical.ly, Xiaohongshu (Red), AirBnB, OfferUp and Slack. Hans was previously a Series A investor and board member for Xiaomi. Follow Hans on Twitter (@Hanstung).